Last Saturday it was again make-day with the dads. 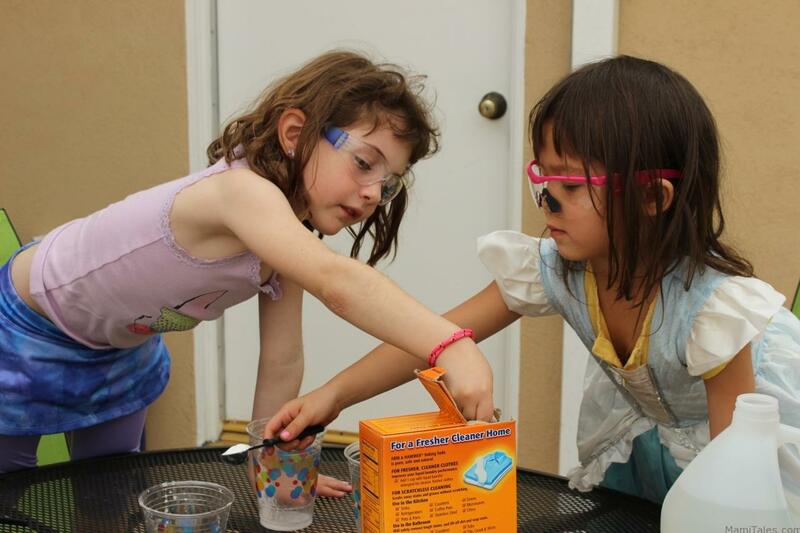 The Little Miss I and Little Miss Z decided they wanted to play around with vinegar and baking soda and do volcano eruptions… meaning, they wanted to do some fizzy science experiments, which the dads helped escalate to another level. Experiment N.1 was to see the reaction of baking soda with vinegar. Experiment N.2 was to find out how much vinegar it would take to make the baking soda overflow from the plastic cup. Experiment N.3 was to see how long it would take for the gas released from combining baking soda and vinegar in a sealed ziplock bag. Experiment N. 4 was to see how baking soda would react with other liquids… so they tried with the same amount of vinegar, lemon juice, apple juice, water and diet cola. Experiment N.5 was trying to recreate the mentos and diet soda explosion… but we bought the wrong mentos… so we cut them in half to try and see what would happen. The result was not as violent as with real candy mentos (we had chewing gum), but it was fine. Experiment N.6 was to try and launch a zeppelin soda container using the chemical reaction of the vinegar and baking soda. The results were NOT what we were expecting. Here’s a gallery-silde show of the different experiments and their conclusions. All in all, it was great fun and another fun day for the girls playing with science. They had their theories and hypothesis of what would happen, and got to try everything themselves. I know my two year old will even get a kick out of this! Can’t wait to try it with her! These are so fun! My kids would love these and we’ll be adding them to our summer to do this. Megan, you should also look into the other science experiments we’ve done so far. Very simple and a lot of fun to do! GREAT idea! My almost first grader loves all things science and experiment! Will definitely check out your other science projects too!! Thanks for linking up to Adventures in Pinterest! So glad you liked it! The other stuff we’ve done is pretty cool too 🙂 Let me know what you think!